VDAX revisited – Implied volatility return vs. Index Return – Computer Aided Finance - Excel, Matlab, Theta Suite etc. 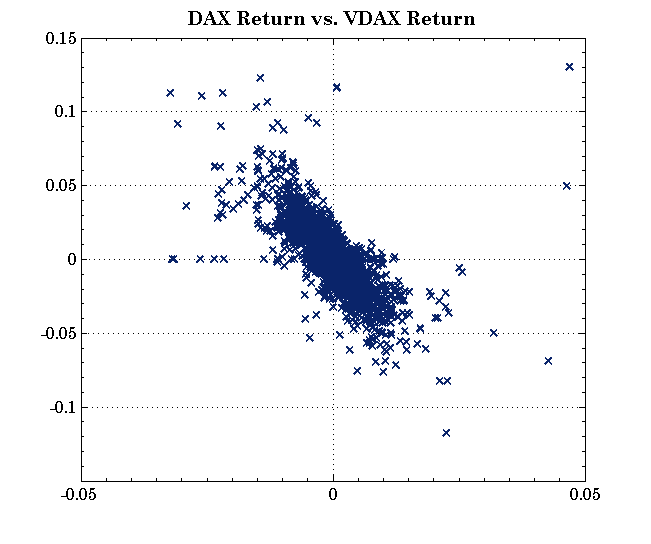 This scatter plot shows a “x” for all trading days in the past 8 years with VDAX return as x-postion and DAX return as y-postion. This plot shows that there is a close relationship between these two. In fact, a little computation shows that they have correlation of -0.72 which is very high. Consider buying a call option: Now, the stock price rises. And the call option price rises because your option is deeper in-the-money: Its asset price minus strike price is higher. But, at the same time, the time value decays because the implied volatility goes down. So, for call option buyers this might be an issue. 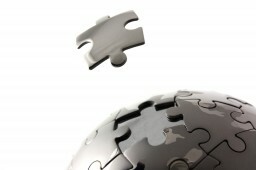 For Put option buyers, this effect works in their favour. The implied volatility rises when the asset price drops. By the way, this is a well-known effect: The implied volatility skew. Looking at the traded options, the put options further in-the-money already trade at a higher implied volatility – VDAX represents at-the-money options only.